[by Kim Min Soo] Orange Brown makeup is a must to try this season. Let’s add elegant atmosphere with an orange color point to the brown hue makeup that can be seemed ordinary. You should be able to enjoy a little joy to the tedious routine of daily life, rather than the prearranged makeup you wear every day. In addition, when comfortable and relaxed brown meet lively orange color, you can complete a makeup look that is mature yet intelligent. Let’s take a look at the essential orange brown makeup this season. In order to complete the orange brown makeup, it is important to produce clear and moist skin without flaws. From the skin care stage, use moisturizing product line to supply the skin enough moisture and finish the smooth skin texture. The key here is to express matte and smooth skin and lip color well. In addition, focus on flawless clean and clear skin expression along with lip makeup. This is because your image can change completely depending on the color of the lips. Actor Kim Hyo-jin, who recently appeared in the official event, created an elegant image by using the tone-down orange color. 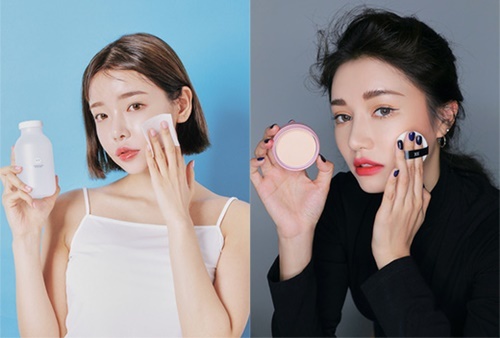 Kim Nam-ju expressed the intensity of the alluring autumn with makeup that shows luxurious dignity. Kim Nam-ju and Kim Hyo-jin’s makeup point is the perfect combination of orange and brown color. 3CE Heat Me Up Lipstick is a matte lipstick that holds lip tension as it applies creamy on the lip. It adheres to the lips as if it was applied with a primer and keeps the pigmentation for a long time.